When the last Transformers:The Last Knight was met with both disappointing critical and fan reaction and poor box office returns, it was clear this series needed an overhaul. One could make the argument that 2014’s Age of Extinction was something of a departure from the first 3 films, it really offered more of the same. Michael Bay had directed all 5 of the first Transformers films, so when I learned he was only a producer on Bumblebee, I was more than a little excited. I’ll be the first to tell you that I couldn’t stand the earlier films, save for a few moments of the third film, I feel them to all be huge disappointments. Bumblebee is really the film we should have gotten all along. What works most here is that the film puts the human element first and foremost. Oh, you will get your extensive action sequences, but it doesn’t keep hitting you over the head with them. It also comes with a very agreeable running time at under 2 hours. Fresh from Pitch Perfect fame it also includes Hailee Steinfeld in the lead and she’s quite the lead character worth rooting for. Hopefully we can get more installments of this sort that put emphasis on character and heart before endless CGI action. This film definitely pulls off the impossible. In what would seem like an obvious summer blockbuster, this had a strange release date of December, but still was met with decent enough business that we will likely get more chapters. While the box office domestically wasn’t amazing by any means, it was probably more due to the fact that audiences might’ve been burned out by the previous 5 films. I do hope it continues to find an audience on Home Video as it’s well worth it. I don’t think it’s a home run, but it’s the closest one of these films has ever come. It’s 1987 and teenager Charlie Watson (Steinfeld) is still grieving over the death of her father. She has a job and then spends her time searching a local junkyard for parts that will hopefully provide her with a dependable vehicle. Since it’s her 18th birthday, the shop owner lets her haul off the Volkswagen beetle. As she’s attempting to start it, Charlie unknowingly sends out a signal to the Decepticons. This is what leads them to earth to try and find B-127 who had his voice robbed from him in the film’s earlier moments. The two Decepticons that come to earth, tell the military that they’re the good guys and the B-127 is a traitor and that he must be eliminated. Before long, Charlie’s new ride turns into our title character and eventually befriends Charlie. This all while Charlie intends to keep his presence a secret. The plot is relatively simple, but that’s part of the film’s charm. The action scenes are also very well-staged and comprehensible, which is a nice change of pace for the series. John Cena plays a former Army Lieutenant trying to stop Bumblebee since he believes him to be the enemy. He actually turns in a fairly decent performance. There are plenty of pop culture references to things from the 80’s from the music to the style and for forth. It’s nice to see a film like this not take itself too seriously. It certainly does have its heart in the right place as Charlie and Bee clearly form a bond. I found it interesting to think back over the film, because large portions of it feel like a John Hughes style film more than a Transformers film. If there is a nit to pick it’s the character of Memo played by Jorge Lendeborg Jr. It’s not that he gives a bad performance or even that the character is a huge distraction, it instead feels as if the filmmakers tried to give Charlie a potential love interest. He feels more like a distraction at times, but he’s at least tolerable. All this builds towards the familiar style climax where the Decepticons battle off against Bumblebee. Thankfully things don’t overstay their welcome. Indeed, the film knows when to quit and that becomes a big plus. I love how understated the film feels. It’s rare for a big budget film of this sort to come across that way, but it does here. There’s also plenty of humor here as Charlie and Bee bond over the course of the film. She introduces him to music and films of the era. There’s also a funny sequence where Charlie, Memo and Bee egg someone’s house. It’s rather amusing what happens, but I won’t spoil things. All this adds up to make an enjoyable film that I hope to see more of. This is what we should have been given from the start, but unfortunately we had to suffer through 5 lackluster films to get it. Anyone who’s seen any of the Transformers films will know what to expect visually. Yes, Bumblebee is a masterpiece when it comes to how this movie looks on screen. And, I have to say, it was nice to see the film in a narrower aspect ratio of 1.85:1. Paramount’s 4K HEVC image is, simply, flawless. The amount of detail in some of the shots is off the charts and with these “transforming” robots, it really does add a sense of depth and dimension to the film. The human component isn’t bad either, as Hailee Steinfeld looks downright amazing and we can make out the individual hairs on John Cena’s crewcut. Color depth is pretty impressive as well, with rich, deep blacks taking full advantage of the disc’s high dynamic range. Any fan of the previous films will know what to expect here and Bumblebee delivers visually. Again, I have to reference the previous films when it comes to the technical specs. Included on this disc is a Dolby Atmos soundtrack that knocks it out of the park. Vocals are sharp and crisp, surround effects encompass the viewer in action from the opening credits to the closing. It’s amazing. It sounds amazing! Dynamic range is off the charts. Every speaker you have will get a workout and the atmospheric soundstage will permeate the room with it’s uncompressed goodness. Sit back, relax and turn this one up to 11. It’ll be worth it. All of the supplements are located on the included Blu-ray, the 4K disc contains the movie only. Agent Burns: Welcome to Sector 7 – John Cena, in character as Agent Burns, gives us a brief introduction to Sector 7. Sector 7 Adventures: The Battle at Half Dome (All-New Motion Comic) – Paramount has also provided a printed comic book and included it in this set, but if you don’t want to, you know, read – this is a visual (read: moving) version of the same comic book. Deleted and Extended Scenes – Nine total, and as expected, none of which really added anything to the film. Original Opening, Drive to Karate Class, Birthday Present, Car Wash and Beetle Breakdown, Charlie Drops Off Mona and Conan, Decepticons Inspect the Armory, Drive to Cliff, Sector 7 and Appliance War are included. Outtakes – This is a new approach to “classic” outtakes as these too are titled: Burns Meets Bee, War Room, There’s a Door in My Way, Charlie in Trash and Saved the World are included. Bee Vision: The Transformers Robots of Cybertron – This one is kind of odd. Firstly, it’s available in English only and features a battle scene between the Autobots and Decepticons and will flash a “profile” of sorts when a new robot is shown. There’s no narrative, only the dialogue that’s going on screen. Bringing Bumblebee to the Big Screen – The only real substance comes from the included five featurettes, though it’s mostly just the executives praising one another. The Story of Bumblebee – We get some commentary from Paramount producers, explaining why they chose the character of Bumblebee, the appeal and how it would make a good movie. The Stars Align – Again, we get some commentary from Director Travis Knight and a few other Paramount execs who wanted to see a “strong” leading role that competed with Shia Lebouf’s character from the original films. As it turns out, it was written in the stars that Hailee Steinfeld fill the role. Bumblebee Goes Back to G1 – We’re goin’ old school! Ok, not really. But the filmmakers reflect on the nostalgia that the first generation of Transformers had and how they tried to incorporate some of the same design into this movie (while still remaining loyal to the other Transformers films, since they do exist in the same universe). Back to the Beetle – Evidently everyone’s favorite Transformer was Bumblebee (mine was Jazz), and the cast and crew laud praise and affection for everyone’s favorite VW Beetle. California Cruisin’ Down Memory Lane – Travis Knight describes that these films evoked three things: wonder, laughter and tears. Uh huh. But he goes further and explains why he wanted to make the film and what made it ever so special. With its heart in the right place and plenty of humor and action, Bumblebee is almost an apology for those like myself who disliked the previous 5 films. It essentially wipes the slate clean. I wish we had been given this film all along, but that wasn’t meant to be. 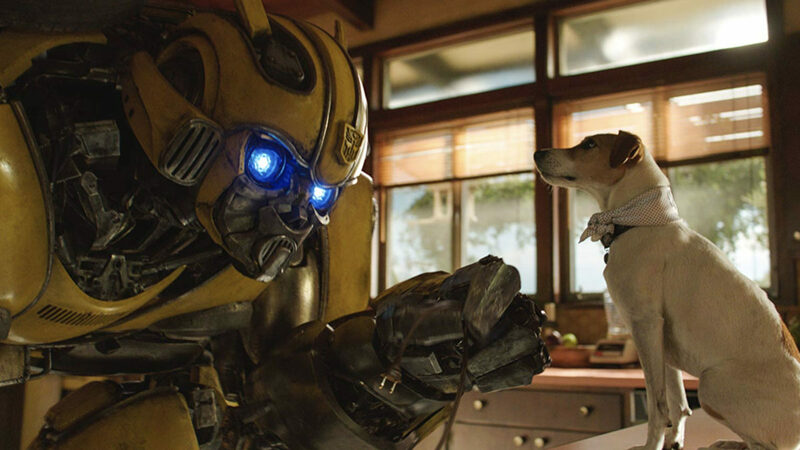 Whether renting or owning, Bumblebee comes recommended.